Logitech Gamepad as EMC2 Pendant: Eagle Schematics for the Joggy Thing! Another pass at my Logitech Dual-Action Gamepad used as an EMC2 control pendant, but this time using an Eagle ULP (User Language Program) that converts a schematic into EMC2 HAL code. 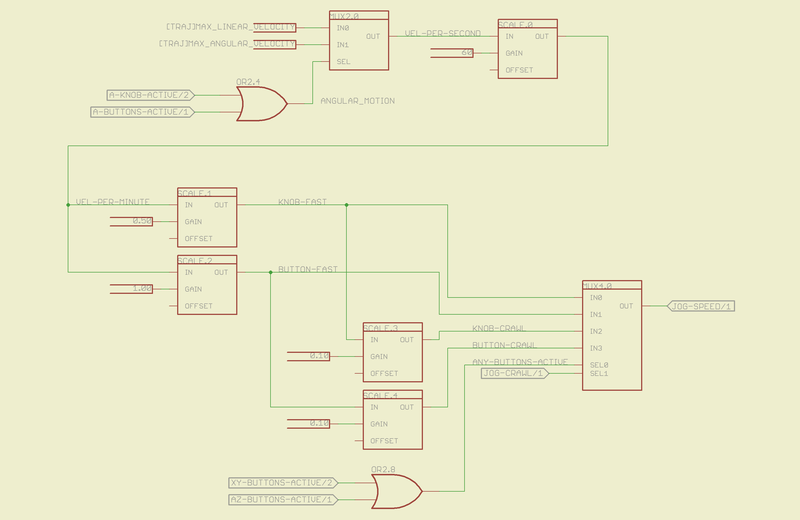 I tweaked Martin Schöneck’s original ULP a bit, added (some of the) new devices found in EMC2.4, added the corresponding Eagle symbols & devices to the library, then drew up a schematic based on my hand-hewn HAL code with some improvements. Ran the script and shazam the HAL code worked just fine (after a bit of debugging the infrastructure, of course). The new ULP and library are not quite ready for prime time, but this is a stick in the ground to mark some progress. You can certainly use the HAL code directly, without fiddling around in the schematic: stuff the whole program (at the end of the post) in your existing (but likely empty) custom_postgui.hal file. The schematic is, of course, much fluffier than the corresponding code, particularly because I chopped it into five easily printed pages. Here’s the Big Picture overview of what’s going on in each page; click the pix for bigger images. The servo thread interface device in the lower left provides the halui timing. The big block in the upper left has all the Logitech gamepad buttons, including the four big ones used for Z and A axis jogging. I changed the two left-rear buttons to activate the Abort signal rather than Estop, not that I use them all that much anyway. The two joystick knobs have pushbuttons, which I combine and use to toggle a flipflop that will select the jogging speed: fast or crawl. I also cut the jog deadband from 0.2 to 0.1, which makes the joysticks much more responsive. The big block on the left has all the gamepad’s analog axes. The HAT0X and HAT0Y axes correspond to the top-hat pushbuttons; they’re not really analog at all, although they take on -1.0 / 0.0 / + 1.0 floating point values. The window comparators determine which joystick axes are active, which comes in handy later on. The HAL jogging control has a single input that sets the default speed, but the proper value is vastly different depending on whether you’re jogging with linear or angular motion. This page picks out which ini file MAX_VELOCITY value to use, converts from units/sec to units/min, then does Cool Thing #1: scales the speed so that the fast/crawl speeds work out nicely. I use the buttons to jog rapidly from here to there, then creep up on the alignment point using the joysticks. Pressing the joysticks downward switches from Fast to Crawl speeds, which provides sort of a gearshift that’s useful for coarse / fine adjustments. 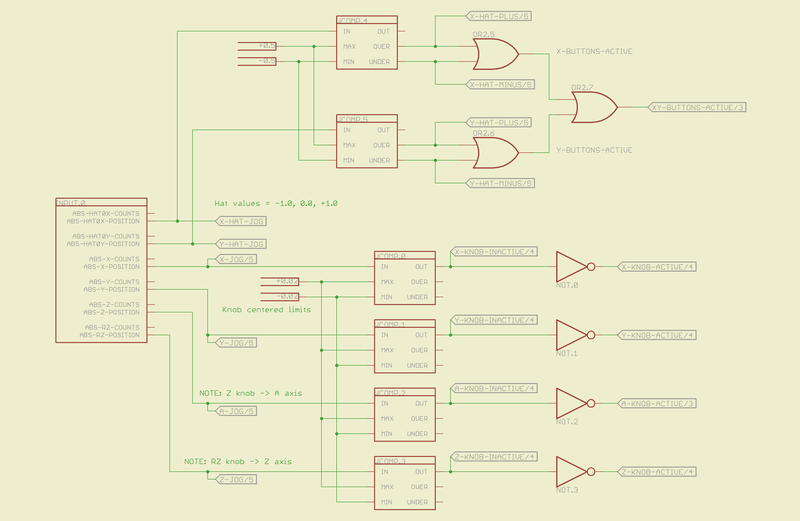 All those values go into the mux4 block and thence to the HAL jog speed control. This page does Cool Thing #2: prioritize the joystick axes and lock out the one that started moving last. The general idea is that it’s painfully easy to move the joysticks diagonally, which is great for gaming and terrible for milling machine control. A pair of flipflops for each joystick remember which axis started moving first. If you want to move diagonally, just press the buttons; they’re not locked out, so you can do what you want. The motion comes together on the last page, where scale blocks flip the direction of the Y and Z joystick axes so positive motion is upward. The multiplexers allow only the active axis of each joystick to reach the HAL analog jog inputs; you can vary the speed of that axis up to the maximum as you’d expect. The buttons drive the digital inputs that jog at that maximum speed; the Y and Z button directions get sorted out appropriately. Those five pages boil down into the following code, which I manually insert into my custom_postgui.hal file, along with the tool length probe pin definition. You’ll also need the Eagle library that goes along with the script, but WordPress doesn’t like .lbr files. Here’s the hal-config-2.4.lbr file with a totally bogus odt extension. Download it, rename it to remove the .odt extension, and it’s all good. There is basically no documentation for any of this. 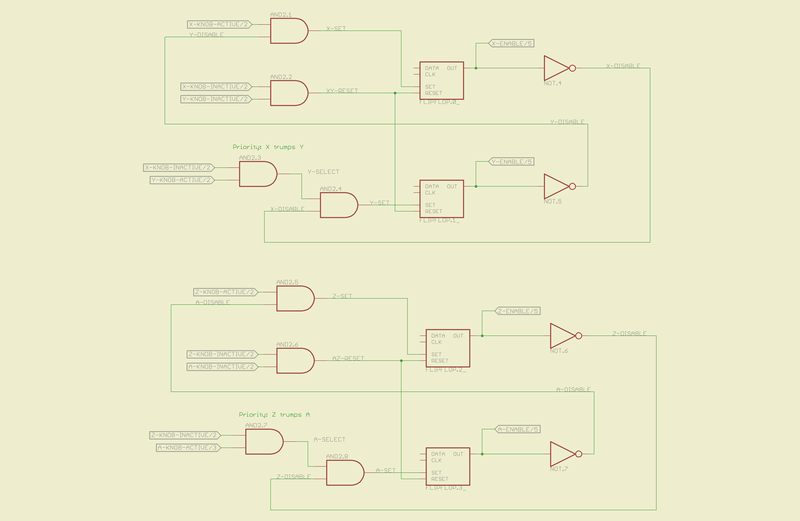 I figured out what to do by looking at the source and Martin’s sample schematic, but now you have two sample schematics: the situation is definitely improving! This entry was posted on 2010-10-23, 07:05 and is filed under Electronics Workbench, Machine Shop, Software. You can follow any responses to this entry through RSS 2.0. Both comments and pings are currently closed. I tried to run this but it appears I don’t have jog.3 in my halui configuration. I have jog.0, jog.1,jog.2 and the third one is jog.selected but it only has the plus and minus options. Any ideas? All I’m trying to do is to keep my x y from moving at the same time using the left joystick. I’m running emc2 2.4.6. That’s (most likely) because you don’t have the A axis set up for the rotary table. Rip out everything connected to that axis and then the Z axis will behave properly: it’s interlocked with A to prevent both axes going active at once. The only references I could find for the A axis was in my-mill.hal and I removed them. My-mill.ini is only set up for 3 axis’s x,y,z. Where can I look next because I’m still seeing not seeing jog.3 in halui? I’m still seeing not seeing jog.3 in halui? You won’t see it unless you’re set up with four axes. You can either configure the machine for four axes (and just not use the A axis) or remove all references to the jog.2 jog.3 in the joystick HAL code… either will work, but it might actually be easier to set up the fourth axis and not use it. So there are only 3 references to jog.2 in the hal code in the above listing. 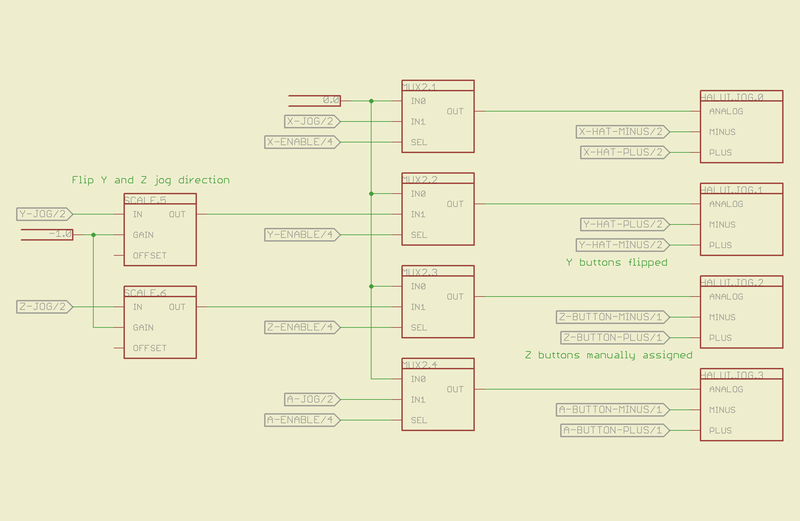 If I understand you correctly removing the references to jog.2 will allow hal to change jog.selected to jog.3? I going to assume that after removing the three references to jog.2 it will not affect the functioning of your hal file. Sorry, typo: meant jog.3, the rotary axis. The jog.2 axis is Z. What I mean by “remove all references to jog.3” is track down everything that has anything to do with the A axis and remove it, reconfiguring the logic that interacts with jog.2 (Z) as you go. 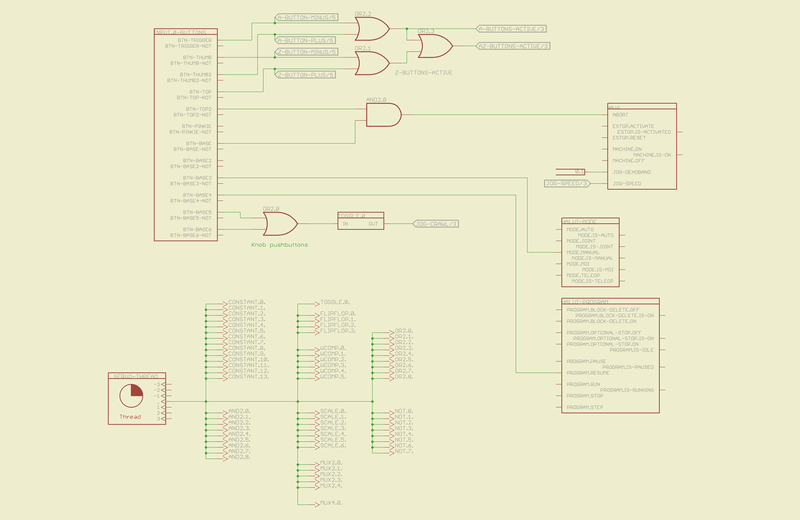 Basically, look at those schematics, figure out where the rotary axis comes in and goes out, then yank all that out… ugh!